Whether or not you rent our costumes for “The Little Mermaid”, you can still participate in our Fundraiser/Concession Program! We know how challenging it is to fund the arts these days and we want everyone to have the chance to put extra money into their programs! We have three really great fundraiser/concession items for “The Little Mermaid”. Some clients order some of each; others select just one item to focus on. Regardless, you can’t go wrong! Sand Dollar Princess Tiaras. 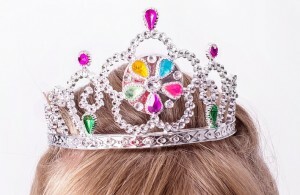 A light-up tiara with the center “jewels” in a sand dollar configuration.What little girl wouldn’t love this? Light-up Tridents. 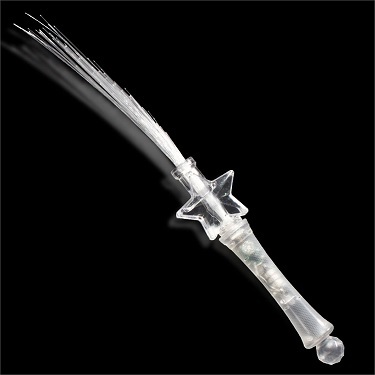 Everyone at your show will think they are “Under the Sea” with this fantastic souvenir Trident. In a curtain speech, invite your audience to join Triton in the Finale by lighting their Tridents. Your darkened theatre will glow! Whether you call it a fundraiser or concession sales, you do not want to miss out on the opportunity to make extra money for your program! And it is SO easy. You return any unsold ones, and we invoice you only for the ones you sold (plus shipping). The biggest sales success is connected to ‘audience participation’. If you can find a way to integrate the use of the wands or tridents into the show, your sales will skyrocket! For example, in a curtain speech prior to the beginning of the show – demonstrate the wands and tridents to the audience. Show how they can ‘magically’ help Ariel regain her voice in Act II. Encourage them to buy one of the magic items during intermission and be ready to help Ariel by LIGHTING UP the theatre.